Cuddle up in the soft comfort of Sectional sofa. The generous size, low armrests, and memory foam that adapts to the contours of your body invites many hours of naps, socialising, and relaxation. 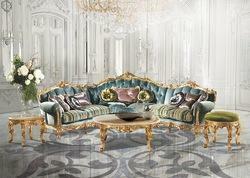 We are offering premium quality of Designer Sofa Set. These are made from top quality of raw material by help of our expertise, high tech equipment and techniques. Moreover, our special processes which bring consistent superior quality.